As current-carrying and potential difference measuring electrodes, platinum was deposited on a quartz glass substrate. Voltage terminal distance can be varied by changing the connection pin. In-situ measurement of the metal transition produced in a conductive polymer insulator doping, 4 terminal electrode is used, where for insulator layer with low doping side 2 terminal method and for metal layer with high doping side 4 terminal method is used for the measurement. With this electrode, become possible to have measurement in 15 distances by combining the connection terminal. 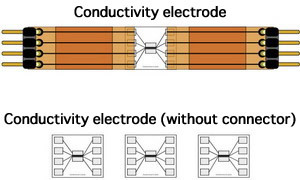 Platinum terminals are deposited on a fused quartz substrate as current supplying electrodes and potential difference probing electrodes.The distance between electrodes for potential difference are adjustable from 40 µm to 250 µm by changing the connect pin. 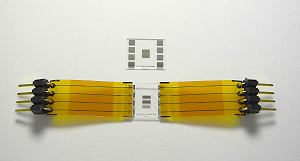 Conductivity electrode has a Titanium adhesive layer of 100 Å, under the 900 Å of the Pt (Platinum layer), in a total thickness of the 1000 Å, which is deposited in a quartz glass substrate. For the measurement of the potential difference, the electrode width is 10 µm, and the distance between the electrodes are 10, 20, 30, 50 and 100 µm. In addition, the current carrying, the electrode width is 1.0 mm, and the distance between the electrodes is 470 µm. For the schematic diagram of the electrode, A and H are for current carrying, and B to G are for the potential difference measurement. For the B to G, changing the terminal, the electrode distance for the measurement could be changing from 10 μm (minimum) to 250 μm (maximum). There are two types of the electrode. The electrode with a connector sheet, can be easy handling, using the connector for printed electrodes or IC clip for printed electrodes. The other one is without the connector sheet, and the user needs to prepare for the connection by yourself.